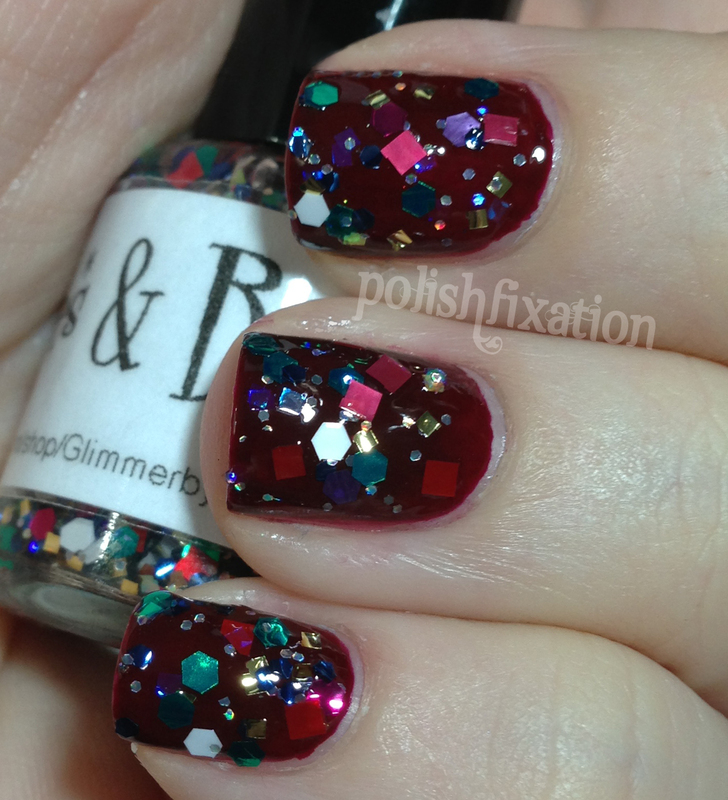 polish fixation: Glimmer by Erica: Winter Collection! Glimmer by Erica: Winter Collection! Hey all! Last day of the year! Hope you all have great plans to bring in 2013! Today I have 5 shades from the Glimmer by Erica winter collection to share with you! Ho Ho Ho "gold holographic micro glitter, red holographic hex glitter, white hex glitter, and black hex glitter, all in a clear base. These colors are what come to mind when I think about Santa Claus, and the child-like wonder we all experienced as children at Christmas time". I layered this one over a medium gray. I love the look of this, even out of the holiday season I think it would look great over a variety of colors. Boxes & Bows "has a multitude of square and hex glitters with some holographic and some iridescent glitters, all in a clear base. It was inspired by all the piles of pretty wrapping paper, bows, and boxes left over after Christmas morning"
Love the look of this one too, it's so festive and very glitter-packed for easy application! Angel Topper "has silver holographic micro glitter, iridescent micro glitter, iridescent square glitter, and iridescent hex glitter, all in a clear base. It is the Angel that tops our Christmas tree"
This one I layered over a teal shimmer, and I adore the outcome! It's such a pretty topper, I don't think there's a color this wouldn't look stunning over! 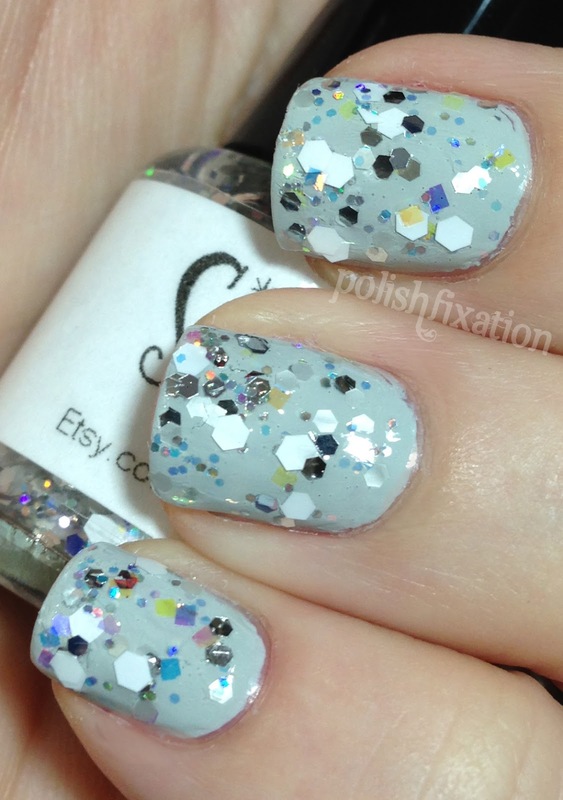 Snow Day "is a mix of silver holographic micro glitter, iridescent micro glitter, iridescent square glitter, silver hex glitter, and white hex glitter, all in a clear base." I know it appears that there are colored glitters in this polish, but these are purely the way the light plays with the silver and iridescent glitters that are packed into this generous polish. I chose to layer over a light grey, and enjoyed the outcome. Winter Wonderland "is a mix of different colored blue hexes, silver holographic micro glitter, iridescent square glitter and iridescent micro glitters, all in a clear base". 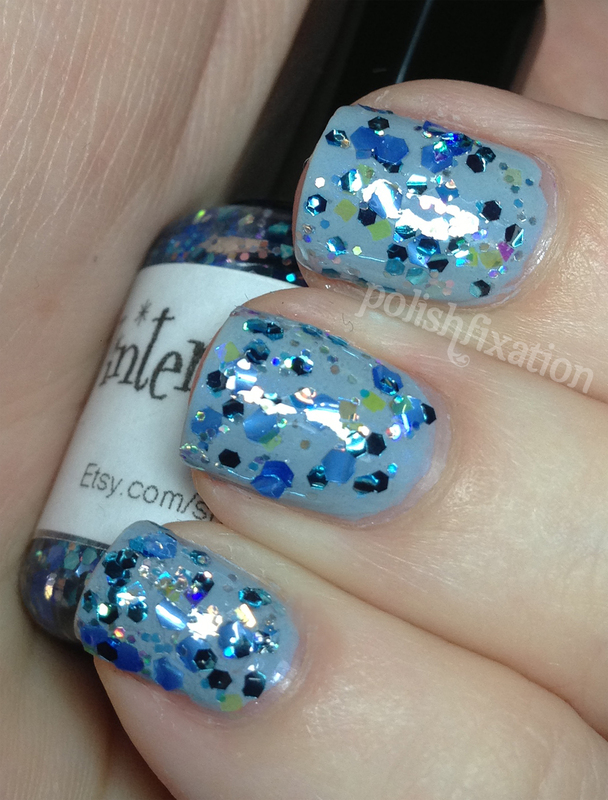 I am totally swooning over this glitter! Just as in Snow Day, the iridescent glitters appear colored (yellow and blue in this case), but those are not actually yellow glitters. I love this one too! Just like the last set I checked out by Glimmer by Erica, these did not disappoint me at all! The formula on them all was great to work with, no curling or bleeding glitters, and really unique and thoughtful combinations! Each Full size (15mL) polish costs $10.00, which I know is on the higher end of the indie-cost spectrum, but I believe the quality of these is well worth the money! Which one of these do you love the most? Have you tried any of her polishes yet? These are really pretty! I think I like Ho Ho Ho the best.